For the first time ever, Minute Maid Park and the Houston Astros are inviting you to its first Annual Deaf Awareness Night! 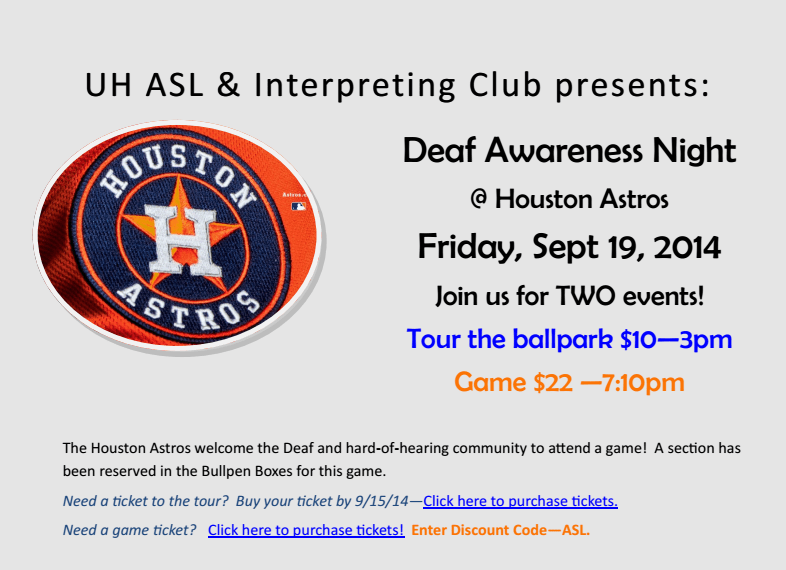 As an early kick-off for Deaf Awareness Week, the UH ASL & Interpreting Club will be presenting Deaf Awareness Night at Minute Maid park on Friday, Sept 19th. The Astros are hosting a special tour in honor of Deaf Community Awareness before the game. For all attending the game, you will have awesome seats in the Bullpen boxes (Sections 152-154). Let’s SELL out the event and increase awareness of the Deaf Community! Choose to attend the tour, the game or BOTH. Ready to buy tickets? Buy BOTH tickets now and let’s spend a day at the park. All are invited to attend to bring awareness to the Houston community about the needs of the Deaf population. Hope to see you there!